Michelle Aytay, a 1996 graduate of the College of Pharmacy, has been selected to receive the University of Minnesota Alumni Service Award. The award recognizes her service as a volunteer who has had a major impact on the University. U of M President Eric Kaler will confer the award at the Oct. 20 Alumni Awards Dinner. Aytay is a past-president of the Pharmacy Alumni Society (2003-2004) and a current member of the Board of Directors of the college’s Century Mortar Club. 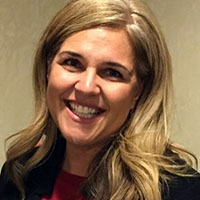 She is also a member of the Board of Directors of the Minnesota Pharmacists Association and has been active as a leader on Minnesota’s Pharmacy Practice Joint Task Force. Throughout her career, Aytay has voluntarily contributed to every aspect of the College of Pharmacy in some way. She has been a preceptor and can often be seen at pharmacy meetings with students who are on rotation with her. She also has supervised pharmacy residents, and her students have taken active volunteer roles when they have been with her.